We love to draw on traditional skills such as still life drawing and painting as well as life drawing and sketching. We love to link our ideas to traditional as well contemporary artist works. We play engagement portrait games and draw round our bodies and see what shapes we can make. We also like to push the boundaries with new materials and see what they can do. 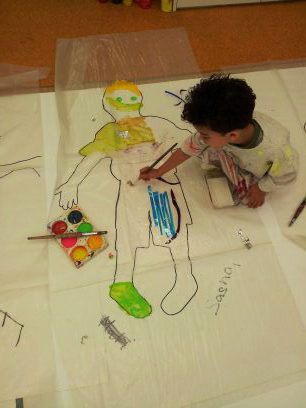 Spinning, trapping, squidging, blowing, even rolling in paint, create endless creative possibilities. So much fun to be had!